A couple with a child and another one on the way wanted their master bath updated from builder-grade. The Wife had images of bathrooms she liked including tile, lighting and vanity. 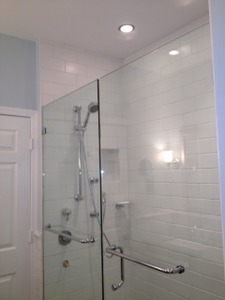 The Husband is more modern in aesthetic and likes clean lines and wanted to get rid of their bathtub and have a large His and Hers Shower. They needed better lighting and more storage. KTID began with finishes such as Marble walls, and Porcelain Tile and Floor. Then we chose the vanity and built-in Linen Closet. We knew that we wanted to add a special design element into the room and suggested a LED light in the Linen Closet custom with Glass insert that while lit showed off a beautiful turquoise art vase. We chose clean lines for the sink and vanity, however more feminine touches with the cabinet pulls and shower accessories. The Mirror had a pretty beaded detail that worked well with the lighting sconces that had a hint of vintage. We specified quartz for the counter top because of its anti microbial properties. 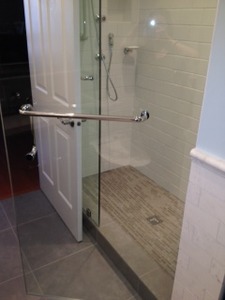 In the His and Hers shower, we specified body sprays on one side, and took the extra time to make sure that the sprays were positioned correctly for optimal performance. 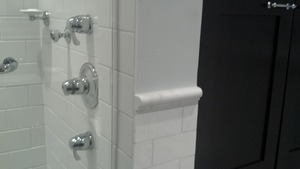 For the finishing touches we chose elegant towel bars, robe hook, hand towel holder, and stand alone toilet holder. Crisp white towels with a gray stripe exude luxury and cleanliness for the finished room. The bathroom was the perfect compromise of classic and modern design with a feminine note.